If you are a regular reader of IPC’s blog, you know that we can get some pretty wild calls. In honor of T-day 2011, here are some of the most bizarre food-related Thanksgiving calls our staff has gotten over the years. The most memorable Thanksgiving call that sticks out in my head was about 10-11 years ago from a woman who simply asked, “Is it safe to eat a turkey that is playing jingle bells?” As the family sat down to their Thanksgiving meal, everyone began looking around asking each other, ‘where is that music coming from?’ The stereo wasn’t on, and even the football game was turned off the TV. Finally they realized it was coming from the turkey. No amount of carving or jostling the turkey would end the holiday serenade. After a lot of questioning and the weekend of calling around, the mystery was solved: the family had gotten the turkey as a holiday gift from the father’s workplace, and the musical device was added to the cavities of these turkeys to add to the festive atmosphere of the holiday. Unfortunately dad’s workplace forgot to warn their unsuspecting turkey recipients about what was in store for them. My next story reminds us why we should never store household products or chemicals near food. A caller’s husband placed some varnish in a Tupperware container and stored it in the refrigerator. The lady of the house (presumably thinking it was a condiment of some sort) used it to baste the turkey. All of the guests remarked how perfect the turkey looked, a beautiful deep golden brown. The left over varnish was made into gravy, which stuck to everything. Unfortunately the mistake was realized AFTER everyone ate this varnish. Or the lost utensil cooked in the turkey! 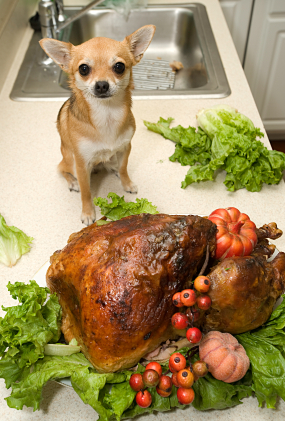 A frantic new mom hosting her first Thanksgiving feast had a Chihuahua that climbed up onto the kitchen table and into the turkey, and she couldn’t get the dog out. I told her to just put it in the oven and consider it stuffed (kidding!!!). I told her to pull really hard and yank the little guy out – it must have worked. I could understand the awesomeness of it from the dog’s point of view, a meat room. Every year we get at least one call where someone uses an oral fever thermometer instead of a meat thermometer to check their turkey. A fever thermometer only goes up to about 110ºF, and a turkey needs to be cooked until at least >170ºF, so the glass can shatter and leak mercury. Glass and mercury is not the kind of dressing your dinner guests are expecting. One of our Thanksgiving guests was culinarily inclined and thought he would contribute to our meal by making some gourmet gravy with the turkey juice that was left over. He was unaware that my mom’s favorite thing to do was not wash dishes, but fill the pan with water and dish soap and leave it to sit for days until someone else decided to wash it. The result: he made a gourmet batch of Palmolive flavored gravy for Thanksgiving dinner! Be sure to visit the CDC and IPC websites for some very useful tips on safe cooking practices this holiday season. Click here for a free Complimentary Packet (sticker, magnet, first aid recommendations) and free online Poison Prevention Education Course and poison prevention education materials.